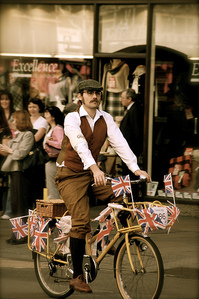 You may already be feeling like you're living in the past at the moment, what with the Chap Olympiad a fortnight ago, the Southbank Vintage festival coming up this weekend, and all that bloody bunting for the Royal Wedding - London is a veritable sea of tweed. But there's yet another way to continue the immersion, if you're happy in your herringbone. Taking the concept of a historical, augmented reality app one step further, Tally Ho! Cycle tours want to whisk you around the locations used in three Ealing Comedies - The Lavender Hill Mob, Hue & Cry and Passport to Pimlico - showing how London was then and now, and finishing with a screening of one film as part of a feature tour over each of the three days. You'll thankfully find Tally Ho! in the free area of Vintage, so you can put the cash you'd otherwise have stumped up for your ticket towards some dapper plus-fours to take the tour in style too. Tickets are £9-12 each, although Londonist has a pair for the Hue and Cry tour this Saturday to give away. Just email your contact details to hello@londonist.com and keep everything crossed we'll pull your name out of a suitably vintage titfer by tomorrow 5pm.